Are We Suffering From Burger Overload? Over the last several years, the Metropolitan area has seen a marked influx in restaurants catering exclusively to those people, such as myself, who love hamburgers. To me, hamburgers are the perfect food, combining all the tastes, textures, and food groups I love, and conveniently edible, no less. Although burgers have long been a bar food staple, dating back to the late 19th century in America, according to Wikipedia, these new burger shops offer a wide array of options, way overshadowing the simple origins of leftover meat stuffed between slices of bread. Are we, perhaps, hitting a burger overload point? Every area burger place offers something different. Ray’s Hell Burger in Arlington goes the route of thick, meaty hand-ground burgers that diners can customize with super-premium toppings such as bone marrow, pate, and Epoisse de Bourgogne. Spike Mendolsohn’s Good Stuff Eatery on Capitol Hill offers a number of pre-selected combinations of ingredients on their burgers, like Spike’s Sunnyside with egg and the Blazin’ Barn with pickled daikon and carrots, between thick Brioche buns. BGR The Burger Joint takes a similar approach, but also highlights a much wider variety of meat choices: beef, lamb, tuna, turkey, and veggie. For the purists, at their two area locations, Elevation Burger serves patties of grass-fed, organic beef with simple toppings on thinner buns that compliment that natural flavor of the meat. Additional options include Big Buns, Crossfire, Five Guys, and Urban Burger. Even though my colleagues Katie and Tricia disagree, I think we are entering a golden age for the hamburger. The market clearly thinks that there is room for growth, seeing as how new burger joints are still opening. Within the next few months, New York chains GoBurger (a spin-off of BLT Burger) and Shake Shack will open in DC and independent brgr:shack will open in Ballston, bringing additional competition and variety. No matter what your preference, you can find a burger place in the area that appeals to your tastes – thick or thin patties, multiple patties, thick or thin buns, simple or outlandish toppings. Personally, I love the fact that I can indulge whatever sort of burger craving I have on a whim. However, some might not feel the same way. So what do you think DC, are there too many burger joints in the area now? Elevation Burger is now open at National Harbor, making it the third location I think. 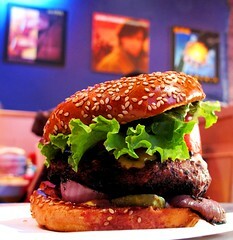 While not my #1 burger joint in DC (yet very solid), what about our own Z-Burger? I think we’re over burgers. They were a welcome respite during the downturn, but Americans have food ADD. What’s next after burgers jump the shark? Gourmet hot dogs, at least for awhile. @BurgerDogBoy I don’t think we’re going to see hotdogs stick around. While ChiDogOs and DC-3 are a nice new addition, I think the Burger has some staying power. Ray’s is still king of when I’m jonesing for a burger! Tom is right — Ray’s is the best burger around. After Ray’s, all the others taste nasty, esp. Good Stuff Eatery, which used to be good stuff, but is now way, way too greasy.